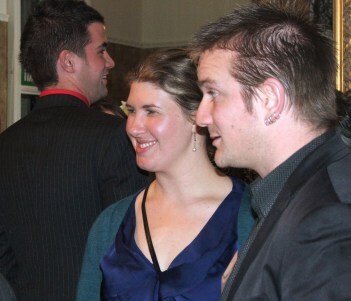 Odd Socks Productions was founded by Nicola Clements, Darryl Alexander, Suzi Holland and Jack O’Donnell in 2008. Since 2010 the company evolved with Nicola Clements heading up the creative direction, and a production team including Anna Drakeford (Production Manager) and Meg Melvin (Funding & business manager). Since 2012 Odd Socks has been the lead provider for NZSL interpreted theatre performances in Auckland and Wellington, and has worked with theatre companies in Tauranga, New Plymouth and Christchurch. In May 2016, Nicola headed overseas to further her own professional development so Odd Socks is now managed by Saran Goldie-Anderson (Creative Director) and Stew Sexton (Financial Director). Odd Socks will announce later in 2016 the appointment of a third director who will be a Deaf community member. So what does Odd Socks Productions actually do? Education and awareness of Deaf culture and community in New Zealand and how they can access the arts both as practitioners and audience members.